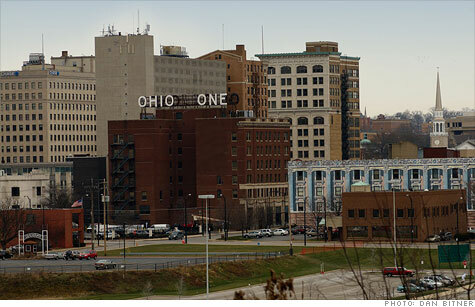 Youngstown, Ohio is the metro area where homes are the most affordable in the nation. NEW YORK (CNNMoney) — Buying a home is now more affordable than it has been in the last twenty years. Thanks to continued declines in home prices and rock-bottom mortgage rates, the National Association of Home Builders/Wells Fargo Housing Opportunity Index hit a record level of affordability. Unfortunately, being able to afford a home and actually being able to buy one are two different matters entirely. According to Barry Rutenberg, chairman of the National Association of Home Builders (NAHB) and a home builder from Gainesville, Fla., potential home buyers are still finding it difficult to land mortgages. “While today’s report indicates that home ownership is within reach of more households than it has been for more than two decades, overly restrictive lending conditions confronting home buyers and builders remain significant obstacles to many potential home sales,” he said. Those who do land a mortgage, will be able to take advantage of rates thatseem to hit a new low every week. This week interest rates for 30-year loans averaged a record low of 3.87%, according to Freddie Mac. Youngstown, Ohio is the most affordable major metro area in the nation to buy a home, according to the NAHB. The faded steel town, located in eastern Ohio, could be on the verge of an economic renaissance with new gas drilling techniques that could help exploit nearby gas reserves, according to the report. There, 95.1% of homes sold during the quarter were deemed affordable to typical local households earning the area’s median family income of $54,900. The other metro areas near the top of the list included Lakeland, Fla., Modesto, Calif., Harrisburg, Pa., and Toledo, Ohio. Among small housing markets, Kokomo, Ind. had the highest housing affordability index with more than 99% of all homes sold there affordable to typical families. Fairbanks, Alaska, Cumberland, Md., Lima, Ohio, andRockford, Ill. were all very affordable as well. New Yorkers could only shake their heads at the housing opportunities available outside their metro area. Just 29% of the homes sold in the New York metro area during the last three months of 2011 were affordable for the typical local family. That’s the lowest level in the U.S. — even though locals typically earned $67,400, roughly $3,000 more than the national median. It was New York‘s 15th consecutive quarter as the least affordable metro area. Nearly as expensive are housing markets in Honolulu, San Francisco,Santa Ana, Calif., and Los Angeles.